The dynamic penetrometer is the oldest and most used tool in the world for soil identification. However, in spite of its high cost, the CPT (Cone penetration test) static penetrometer is a reference throughout the world, especially because it has a very large data base that allow geo-mechanical parameters to be determined from the point measurement, known as qc. 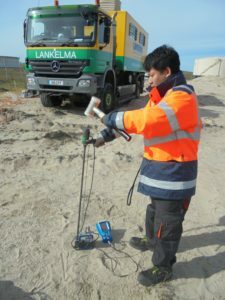 The Panda® is a dynamic penetrometer that interests the geo-technicians throughout the world, who appreciate its low cost, the simplicity of testing, its penetration power and above all the quality of the measurements obtained, which are comparable to those provided by the CPT. Consequently, several researchers and engineers of Sol Solution customers have attempted to establish correlations between the Panda® and the CPT. Sol Solution has just undertaken a vast bibliographic synthesis to consolidate and confirm the correlation between these two tests. Over 100 Panda®-CPT comparative surveys in over 30 countries have been performed since 1995, and are being analysed by the company’s R&D team. The results will be integrated into the software Geosprint©.